What great conditions for the annual Stan Heritage Hdcp. 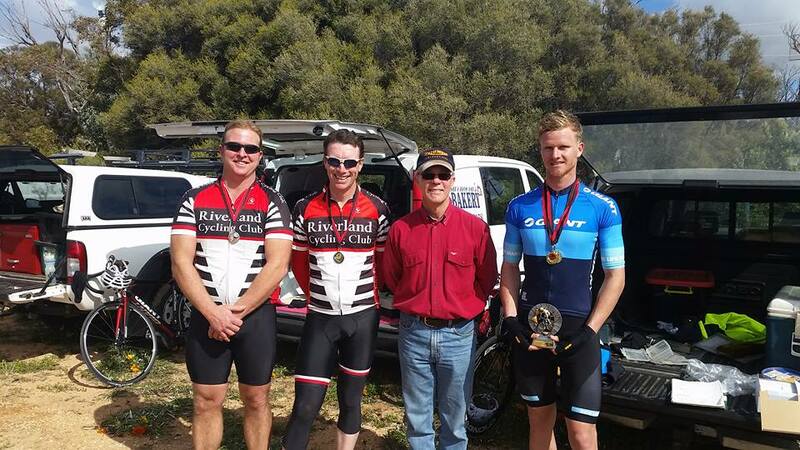 A delayed start was discussed but the early fog completely lifted by the time the race started.12 riders turned up eager to have a chance to take the Stan Heritage shield home for the next 12 months. The limit bunch was made up of Angelo Ylia, Peter Weston & Clayton Bond. Next off at 6 minutes was Glen Obrien, Mick Gray, Lee Rasheed & Peter Burr. Chopping block was made up of Lee Stevens, Shane Pitman, Angus Boase & Stephen Jaensch they had a 13 minute hdcp imposed on them. On scratch was Mathew Benson on his own with a 14 minute hdcp. What a race! Early on it looked as though all groups would finish in the order they started. Until the second part of the race that is. Chopping block caught Glen Obrien who had been dropped by his own group about 5km�s after the turn around point. Chopping block worked well with Lee Stevens in good form driving hard. Block with Obrien now in the group caught the group of Rasheed, Gray & Burr. The limit bunch all the while slipping under the radar & riding hard with Weston, Bond & Ylia all contributing. Matt Benson on his own turned himself inside out to catch everyone! He managed this just prior to the whole peloton catching the limit bunch. Benson who had ridden at 40km average to catch everyone was not letting up. He towed the whole group along & attacked many times, splintering the peloton in the end. Only Stevens was taking turns on the front until Benson attacked again! He kept the pace up high & attacked about 1km from the finish. Benson ensured the sprint legs of Stevens & Pitman were no longer a threat. Benson won by about 50m from Stevens who also had the same margin over Pitman.